Lindsay: Since we’ve already looked back at the 2006 French Open men’s draw, as we gear up for the French Open this year I thought it would be fun to take a look back at one of the more random women’s French Open draws in recent memory–which is saying a lot. The Myskina Slam! Lindsay: To be honest, this is not a slam that I watched live, though I have heard so much about it in recent years. It’s just hard to imagine that there was a clay court tournament with Henin, Serena, Venus, Davenport, Mauresmo, Kuznetsova, and Capriati, and yet there was a Dementieva/Myskina final. I’m excited to look back and see how it all unfolded. Juan José: Yes! Like you, I didn’t watch much of this slam, either for the men or the women. I lived in Argentina at the time, but 2004 was a very busy year for me. I do remember watching the train wreck final between Coria and Gaudio, but let’s save that one for another day (or for no day at all). Juan José: Looking at these is fascinating. Henin is No. 1, and she won the French the year before. So many Russians in the top 11: Myskina, Petrova, Dementieva, Zvonareva, and Kuznetsova are all there. Lindsay: I know–it really was the heart of the Russian invasion. Juan José: And also, so many Americans! The Williams sisters are there, but you have Davenport, Capriati, and Chanda Rubin all in the top 13. Lindsay: I know! It’s so weird to see, and is a reminder about why there’s so much panic about the state of the American game now–last generation spoiled us! Juan José: True dat. Greatness spoils fans, which is unfortunate for those pros who have to follow said batch of great players. By the way, I just looked, and there are eight Russians among the 32 seeds. So one out of four seeds at that year’s French came from Mother Russia. That’s nuts. Lindsay: Sharapova, who would win Wimbledon the next month, was the No. 6 Russian! Juan José: Yes! And if you add the six Americans, you get the interesting little factoid that almost 44% of the seeds at that year’s French Open came from the US or Russia. Isn’t that amazing? Lindsay: Crazy. Speaking of American seeds, I didn’t really know that Lisa Raymond had been ranked so high in singles! Juan José: Me either, and I got the same feeling with Paola Suárez. I do remember that she got some press (but little to no match coverage) for her doubles exploits with Virginia Ruano Pascual from Spain in that decade. They won eight Slams: four French Opens, three US Opens, and one Australian Open. They made the Wimbledon final three times, but never could get one of those. Paola Suárez got to No. 9 in the world in singles at some point, all while she was half of one of the dominant doubles team in that decade. Lindsay: That’s awesome, I didn’t realize it. All in all, it’s a stacked field. Ten of the seeds made the French Open final at some point in their career! Juan José: Shout out to Fabiola Zuluaga from Colombia. So nice to see someone from the Andes ranked so high. Oh, and a few things: doesn’t Anna Smashnova have the most tennis appropriate name of all time? Also, Anna Smashnova … from Israel? Lindsay: Haha – I was just about to say that. It’s amazing, almost looks made-up. Juan José: Should Karolina Sprem thank the heavens that she had her career before the autocorrect era? Lindsay: Luckily she’s still in our lives as Mrs. Baghdatis! Lindsay: There is one very obvious thing to talk about. Tathiana Garbin shocked Henin-Hardenne. Juan José: That had to be huge, right? Henin was the World No. 1, and the defending champ. Also, this is Tathiana Garbin we’re talking about. The (small) percentage of Twitter that’s allocated to tennis would blow up if that would happen these days. Lindsay: Haha, yeah, I mean, that’s pretty much it. I had certainly never heard of her! Juan José: Isn’t this what Lukas Rosol’s Wikipedia page is destined to look like? Lindsay: Rosol won a title at least. Juan José: So did Garbin! Her highest ranking was No. 22. That upset had to be absolutely nuts. Razzano-esque, even. Lindsay: Here’s an article about the upset. Sounds like Henin was coming off of a layoff. Also, the match sounds insane. The match was played in cloudy, cool weather, and light rain fell at the end. Henin-Hardenne fell behind 4-1 but rallied and served for the set at 5-4. She double-faulted to lose the game, and serving at 5-6, she double-faulted again and lost at love. Henin-Hardenne trailed 2-0 in the second set, then won four consecutive games. She double-faulted to lose her serve for 4-all, then double-faulted again in the final game to give Garbin two match points. Garbin closed out the upset with a confident backhand pass down the line, then sank to her knees grinning. Juan José: That sounds interesting. And the match seems like it was high drama. Also in Section 1 … Zheng Jie! She made it all the way to the fourth round. Funny to see her there – just on Thursday night the Tennis Channel was showing a clip from Brussels, where she lost to Oprandi. Lindsay: Ashley Harkleroad sighting. Hard to imagine her winning a match on clay. Juan José: Yes! Also, isn’t it Vera Dushevina, and not Douchevina? Lindsay: Indeed! I didn’t even notice her there. Seems she Americanized the spelling … good call. Juan José: I also have no idea who T. Perebiynis is, but she beat Dokic, who was on her way down the rankings from No. 4 just two years before. Lindsay: Yeah, I was just on Perebiynis’s wiki. She didn’t do much. Lindsay: Baby Bepa! Gosh I miss her. Juan José: ClayPova: Origins! I had no idea she made the quarters at the French in 2004. Lindsay: It set the stage for her Wimbledon breakthrough. It’s still incredible to me that she was so good when she was so very young. Lindsay: She knew how to zone even back then. Juan José: Do you know who M. Weingärtner is? I don’t remember her at all. She was 24 at the time, but never made it past No. 36. Yet she made it to the fourth round here. Lindsay: I’ve heard about her from that match where she beat Capriati at the 2003 Australian Open in dramatic fashion, but that’s all I know. Juan José: That had to be interesting. Lindsay: Petrova’s in there too, back when she was a top 10-er. Actually, Weingärtner took out Petrova that year and there is proof of it on YouTube! Most Slam matches won without a Slam to show for it: Nadia Petrova (109). Juan José: I find it hilarious that the only person to take a set off Mauresmo in that quarter was Anabel Medina Garrigues, aka AMG. Lindsay: That scoreline is hysterical. Juan José: 6-0, 4-6, 6-1. AMG was 22 back then. Lindsay: I just love that Jill Craybas and Lisa Raymond are both in this section. And here’s a Lisa Raymond fun fact. Her career high singles ranking was No. 15 … in 1997! Lindsay: I always just think of Shaughnessy as a doubles player, I had forgotten that she went up to No. 11 in singles and made the Australian Open quarterfinals. Juan José: I had no idea about either, actually. Her name comes up, but I missed the entirety of her career, apparently. I’d also like to say that Silvia Farina Elia has one of the most musical names ever. Such a nice flow to it. Juan José: Also, the incomparable Jelena Jankovic is there! Nineteen at the time. And of course her match was a three-setter. Lindsay: And of course she won the first set and lost. Because JJ. Juan José: Epic, right? 0-6, 7-6, 0-1 – RET. Lindsay: According to the Jewish Virtual Library, Smashnova retired from that match with severe cramps. LOL. Juan José: Jewish Virtual Library? That’s epic. Lindsay: It came up when I googled Smashnova/Dementieva, hahaha. Juan José: That website brings me back to the ‘90s. GEOCITIES FTW. Lindsay: Dinara is in this section, as the No. 32 seed. She struggled. She barely beat a qualifier in the first round and lost to an American qualifier I’ve never heard of in the second round. Oh Dinara. Juan José: Mandatory Dinara Safina sad face. Lindsay: Wow – Irvin (that random American qualifier Dinara lost to) has professional wins over Justine Henin, Jelena Jankovic, Dinara Safina, Anastasia Myskina, Meghann Shaughnessy, Elena Bovina, Amy Frazier, Gisela Dulko, Bethanie Mattek-Sands, and Marion Bartoli. Marissa Irvin’s wikipedia page is in-depth. Juan José: Yeah, that Wikipedia page even has her high school GPA. I bet Irvin wrote it herself. I mean, when does someone who didn’t crack the top 50 get such a detailed Wikipedia page? Lindsay: I bet her mom did it. Lindsay: Davenport blew through her draw, but it was a pretty easy draw up until Dementieva, who crushed her. Juan José: I miss Dementieva quite a bit. Her groundstrokes were so fantastic. And her serve was so … not. Lindsay: I was a Dementieva KAD. Loved her. Still do. Still mad she never won a slam. Oh gosh, going to a dark place. Juan José: Yes. And this was one of the two big ones she blew. So unfortunate to see her leave without a slam, but at least she got that Olympic gold medal. By the way, I think she could still be competitive these days. Particularly as we see pros go deeper in their careers than they did in the past. “Xavier Malisse won the last third-round match, beating 2002 champion Albert Costa 6-4, 2-6, 4-6, 7-6 (4), 8-6. Malisse overcame two match points before play was suspended in the fourth set Saturday because of darkness. Juan José: It sounds like the most Lindsay match ever. Lindsay: Myskina and Kuznetsova. That looks like a fun fourth round match. Juan José: Yep – 1-6, 6-4, 8-6. I like how Molik took a set off Myskina in the first round. And isn’t Strycova the one that was just recently suspended for doping? Juan José: There you go. Here’s another great name: Myriam Casanova from Switzerland! Lindsay: Yes, what was her story? Her wiki is not as thorough. Juan José: I was just now looking at it. Love that last line in her bio: “She played on the 2002 Brasil Open – Women’s Singles event.” As in, “she played in some low level event.” How’s that noteworthy? Casanova didn’t win that event – she didn’t even make the final! Lindsay: It is not. But that draw looks fun! Monica Seles was the defending champion, but lost in the semifinals to Eleni Daniilidou. Juan José: But hey, Casanova did manage to win a WTA title, and she beat Arantxa Sánchez Vicario in that final – on clay! Lindsay: I don’t have anything else to say about this one except that I really wish Kuznetsova/Myskina was on YouTube. Juan José: Yep – that had to be amazing. Too bad the broadband era hadn’t swept over the world yet. 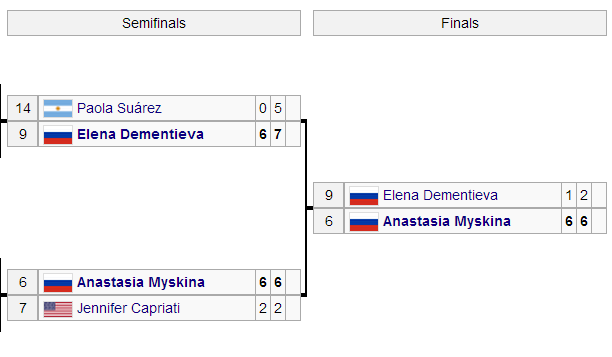 Lindsay: According to Wikipedia, Myskina saved match points in that match. Juan José: Wow. Never past the second round, and then she wins it. The first part sounds like Grigor Dimitrov these days. The second part does not. Juan José: Venus, Mary Pierce, Srebotnik and Zuluaga are there. Lindsay: I don’t know Zuluaga. Juan José: I’m reading about her. She won five titles out of six finals. Four of those were in Bogotá, where she’s from, incidentally. She really made the most out of that home court advantage: she won seven titles there (four on the WTA tour, and three on the ITF tour). Lindsay: She was the Queen of Bogota before JJ made it cool. But she made the semis of the Australian Open in 2004! Juan José: I had no idea about that! The hilarious thing is that even though she had that amazing Australian Open run, Zuluaga never made it past the fourth round of the French, or made any hard court finals. Lindsay: She made the semis of the Australian Open by beating Asagoe, Diaz-Oliva, Craybas, and Kapros. Then got a walkover from Mauresmo in the quarterfinals. Hysterical. Lindsay: So Venus really didn’t have much trouble in that section. So bizarre to think of her easily making the quarters of the French. She beat Tammy and Pierce along the way, but nothing extraordinary. Juan José: Nope – and Pierce was four years removed from her Roland Garros title. Interestingly enough, Mary would make the US Open final the following season, as well as the quarters at Wimbledon. But at 29 in 2004, Pierce was definitely winding down. Lindsay: Oh man, Capriati/Schiavone. Fun. Juan José: That section is so entertaining. So many names from the current era. Lindsay: Sam Stosur got crushed in the first round by Grönefeld! Juan José: Vinci making it to the main draw from the qualies. Razzano and Bartoli, too. Lindsay: Razzano is in there as a wildcard and it looks like she played a great match against Fran in the second round. That would’ve been amazing to watch. And young Bartoli is there, barely making a splash. Juan José: Also, there’s Virginia Ruano Pascual, playing singles just like her doubles partner Paola Suárez. They won the French Open doubles title that year. Lindsay: I remember Bovina a bit. Injuries really killed her career before her time was up. Juan José: Yeah, I remember Bovina, too. Unfortunate name, also. 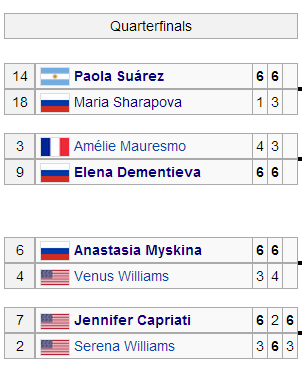 But back to the eventual quarterfinalist Jennifer Capriati: her career was so random, isn’t it? Gold medal in 1992 (! ), and then three slams between 2001 and 2002. All in all, Jennifer won six singles titles from 1990 to 1993, and the rest came from 1999 to 2003. Lindsay: Yeah, I was at Capriati’s Hall of Fame induction last year, and it was so bizarre and sad to hear about and think about all of the ups and downs. She has it so rough. Juan José: Yep – and now she lets us inside her head with Twitter! Which may or may not be a good thing. Lindsay: Sigh. But 2004 really was one of her last good years on tour. Juan José: I’m amazed that a movie hasn’t been made of her life. It’s nuts – she was in the top 10 at age 14! Juan José: What? 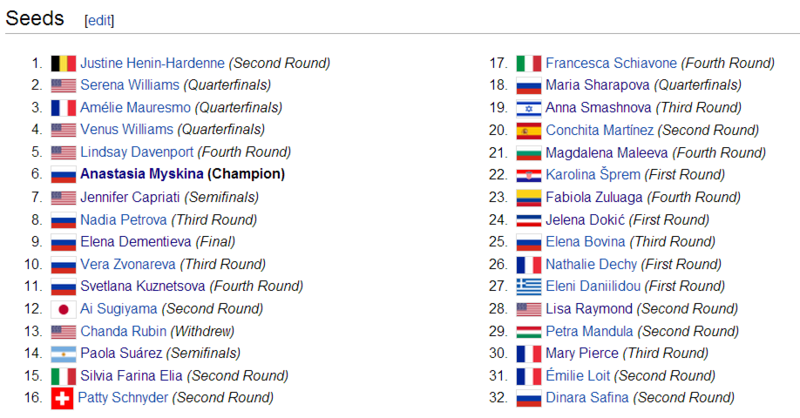 What the heck was Martina doing in a Slam main draw in 2004? I can’t stop laughing. I mean, what the heck? SHE WAS 47 YEARS OLD. Lindsay: I had forgotten all about this. Martina took a wildcard at the French Open and Wimbledon and Gisela Dulko beat her in both tournaments! Dulko beat her in the second round of Wimbledon though, so she actually won a match at Wimbledon and became the oldest person to ever win a singles match in the Open Era. Oh many, this entire section is hysterical. You have Asagoe beating Hantuchova, Schnyder, and Dulko. Juan José: I vaguely remember Asagoe. Lindsay: I do not at all. Juan José: 2004 was Asagoe’s banner year: fourth round at the French (best result ever) and quarterfinals at the US Open (ditto). Daniela Hantuchova, bringing the LOLs for years. Juan José: Not the first time Hantuchova would melt down at Wimbledon! I really hope Indian Wells makes a statue for her. Or names Court 17 in her honor. Lindsay: Man, I’m so mad I can’t watch that Kirilenko/Serena match — I’d love to see a young Kirilenko actually give Serena a battle. Look at that scoreline! Juan José: Yep, and that was REALLY YOUNG Kirilenko – just 17 years old! Also, let’s not forget Patty Schnyder. She was so much fun to watch. Her shade of crazy is alive and well in Benoit Paire these days. Lindsay: YES. They would get along. Stan needs to introduce them. Juan José: This has to happen. Get on it, Stan! Still, nothing beats having 47-year-old Martina Navratilova in this draw. I mean, that’s incredible. Lindsay: You’re right, nothing beats a 47-year-old Navratilova. Juan José: Hey, Sharapova had a similar run in that 2004 French Open to the one she had at this year’s Australian Open: she blitzed everyone on her way to her last match, and then got blitzed herself. And that was the end of “ClayPova: Origins.” And like you said, she would win Wimbledon a few weeks after that. Lindsay: All of the quarterfinals were blitzes except for the Serena/Capriati one, which looks quite amazing. I’m enjoying watching the highlights, if only for Serena’s hot-pink midriff-baring ensemble. So 2004. OMG. AT EVERYTHING. FROM THIS ARTICLE. Juan José: “Tennis-dad role model” is used in the same sentence with Stefano Capriati. This is amazing. Juan José: “Talk to the hand dad.” Wow. That’s nuts. Lindsay: Isn’t it? But really, all of this just makes me think about all the times Serena has lost in the quarterfinals at the French Open. This is not the only time that she was a favorite in the quarterfinals and lost a close match. It happened against Kuznetsova in 2009 and Stosur in 2010 as well. Juan José: That’s fascinating about Serena, it’s worth remembering that even when she looks unstoppable, she’s always more than a little vulnerable on clay. Lindsay: For some reason she feels the pressure more on clay too, maybe because of defeats early in her career. Juan José: I wonder if she’s never really gotten over the Justine incident in 2003. I mean, that was super traumatic, and I wouldn’t blame her if adversity triggers all sorts of things when she’s in Chatrier. SI.com: If you could go back and replay any match in your career, which would it be? Williams: The 1998 French Open fourth round. I played Arantxa Sanchez Vicario and I was [two points from winning the match twice]. And I tell you, I would have won the French Open that year [if she had beaten Sanchez Vicario]. I know I would have won the French Open that year. Unfortunately, she won. Lindsay: Isn’t that fascinating? Out of all the matches in her entire career, she picked one from 1998 in the fourth round of the French Open! Juan José: I had no idea about that. Some tennis players are truly like elephants, no? They forget nothing. 1998, that’s nuts. Fifteen years ago! Lindsay: Serena is just 2-5 in French Open quarterfinals, and four out of five of her losses were in three sets. Juan José: Wow. In a way, wouldn’t a Serena win in Paris this year rank among her top achievements? It would be 11 years after her lone Roland Garros title! I also think it would go a long way towards exorcising those demons from 2003. Lindsay: Serena has definitely had some brutal losses at the French Open, more than any other tournament. It’s weird too. I mean we think about these random WTA French Open winners … Myskina, Ivanovic, Kuznetsova, Schiavone … Serena was in the draw at each of those tournaments! So it will be interesting to see what happens and if Serena can truly exorcise those demons. I agree with you, JJ, it would be one of the most impressive things she’s done in her career. Lindsay: Back to the Myskina Slam. So basically the quarterfinals were a bloodbath for the tournament. Juan José: Pretty much. In came Sharapova, Mauresmo, and the Williams Sisters, and out came Paola Suárez, Dementieva, Myskina and Capriati. Juan José: Also, it seems like Myskina caught fire. Lindsay: After saving match points against Kuznetsova, she was playing with house money! Mauresmo missed a great chance that year to take her home title, didn’t she? I mean, she just had Dementieva, Suarez, and Myskina, but couldn’t even take a set off of Dementieva. Juan José: Agreed on Mauresmo – she never really felt comfortable at Roland Garros. And looking back, this surely was a missed opportunity. So I just looked, and found this fascinating: Dementieva and Myskina played each other 15 times. By the time of the 2004 French Open final, they had played nine times, with Dementieva winning five of those. The problem for Dementieva, is that she lost all three clay matches during that stretch. Interestingly enough, all three were three-setters. So at least people had reason to expect a close final. Which was FAR from what they got. Lindsay: Wow, that’s crazy. Yeah, I mean I’m surprised Dementieva ever did well on clay, that really speaks to her talent. Hard courts and grass suited her game much better. Juan José: Do you like how out of all the quarterfinals, semifinals, and the final, the Capriati-Serena match was the only one that went three sets? Moreover, of the six sets played in the semis and the final, there’s one bagel, one breadstick and three 6-2 sets. Lindsay: All these stars made it to the quarterfinals, and then there was only one good match and Myskina won the tournament! Myskina just couldn’t miss, it seems. I mean that’s just an insane run. To take out Kuznetsova, Venus, Capriati, and Dementieva? That’s like 12 slams, two gold medals, and two number ones. Juan José: Yep. That Kuznetsova match started it all. Myskina was just 22 – turned 23 in July of that year. After that Roland Garros win, she made the San Diego final, semifinals at the Olympics, won Moscow, and won all three rubbers in the Fed Cup final vs France. The next year, she lost in the first round at the French, made one final (Stockholm), and won a title (Kolkatta). And that was the end of her career, essentially. She made three finals in 2006, but nothing after that. Lindsay: Wow. She is pretty much the definition of a one slam wonder. Well, behind Thomas Johansson. Juan José: But the thing is, at that age with those accomplishments, isn’t it kind of a tragedy that she flamed out so early? She was only 22 when she won her lone major, and it’s not like she even hung around the tour for much longer. By the time Myskina played her last Slam, she was just 25 years old. That’s kind of shocking. She made the quarterfinals of all the majors. The last quarterfinal she made was at Wimbledon in 2006. But in 2007, she only played one major, and never again was seen at a main draw of one of the big ones. Lindsay: That is shocking, JJ. Was it injuries or apathy or just both for her? I think burnout was an issue. And she’s a mom now. Juan José: Yeah, I think it’s best to let our readers tell their Myskina stories. I barely watched her play: all I remember is that she wore shorts a lot. Lindsay: Agreed. I look forward to hearing our readers tell us more about Myskina! Venus was actually heavily favourited for this French Open as she came in on a near 20 match win streak on clay….Sharapova only overtook her in Madrid as the active player with the longest clay winning streak. Also, Myskina suffered from serious “back-up successful year pressure” syndrome in 2005, as well as dealing with her mother being very ill, highlighted by losses to Julia Schruff (the quallie who played Dinara here) in Berlin and Maria Sanchez Lorenzo in Paris. Once she got the defending RG off her back she kinda got going again. She made the 2005 quarters at Wimbledon, coming from 1-5 in the third to beat JJ (who would beat Venus at Wimbledon the next year before losing to Myskina again). She also played one of the best finals in Eastbourne history losing to Justine Henin in a final set tiebreak. Unfortunately, she suffered some serious injury in her foot. Seeing as she was a poster girl for counterpunching….it seriously impinged on her playing and after being beaten 1 and 0 by Meghann Shaughnessy in the 2007 RG first round, she never played a WTA level match again. Calling Ivanovic and Kuznetsova random French Open winners is a bit of a stretch. Kuznetsova had already been in a French Open final before, had match points against Henin in ’05 and had a terrific clay season in the lead up to the event by winning Stuttgart (beating Safina) and making the finals in Rome. Ivanovic was the no. 2 player when she won, made the finals the previous year beating the no. 3 & no. 2 players in the world, won Berlin the previous year and made the Australian Open final earlier in the year. So… If anything, they were expected to do well and did so. Thanks, guys for the look back. I remember Dementieva, one of my favorites, just being at a loss to serve the ball in the court in the final against Myskina. “Even that I lost today, it’s a great day as a tennis player, but it’s a day to remember Sept. 11, 2001, and Sept. 1, 2004; we lost hundreds of children in Russia,” Dementieva said, referring to the siege in Beslan that resulted in hundreds of deaths two days later. Myskina was one of a kind. Her temper/tantrums are legendary. The reason why she really had that ugly slump is that her mother got sick like Jacob said and she also choked her SF match away in Athens (Olympics). It killed her. She had a decent 2004 summer, making the F in San Diego and the SFs in Montreal. Youtube her tiebreak against Zvonareva, just insane. Finally, Kurhajcova led Raymond 6-0 5-0 40-15 in the first round but lost the match. PEAK WTA.